Back in 2012, I made one of Marcy Tilton’s jackets, Vogue 8709. I dipped into my stash and pulled out a rayon woven in rust and black, and found an old silk/cotton woven for cuffs and collar. A lot of work went into this top, and when it was done, it cried to live in someone else’s closet. Last summer our friend, Diane, invited it to live in her closet. When we arrived for “orphan’s dinner” at their home on Thanksgiving, she was wearing it and both she and the top looked very happy. Isn’t it nice when a fail is passed to someone else and becomes a success?! 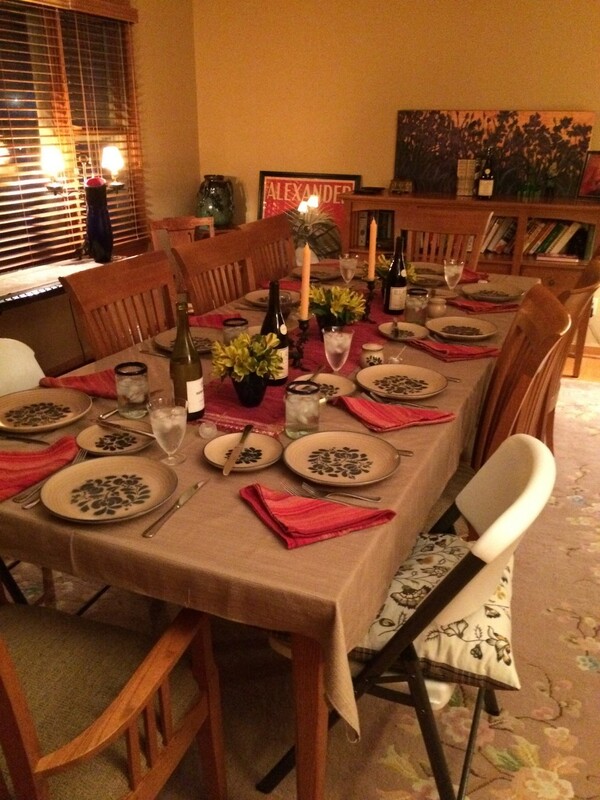 And look at the beautiful dinner table Mike and Diane set for our group of close friends. What a lovely evening.